1. Rice noodles. I think these are my favourite noodles IN THE WORLD. I think my obsession started when I lived in Ipoh in Malaysia where they are famous for their rice noodles. I don’t know how or why but their noodles are chewy and not disintegrate-y (as they so often are in this country), it’s like slurping up a bowl of silk. Edible silk. Ever since then I’ve been on a mission to find similar noodles and have, thus far, failed miserably. Saigon Saigon on King Street, however, are doing pretty well on the noodle front. 2. Broth. Very difficult to explain this so all I’m going to say is this: IT IS THE BEST BROTH IN THE WORLD. 3. Meat. The above photo has beef brisket and thin slices of beef fillet. There is no other way to eat it. If they try to give you anything else say, “NO. I want my beef brisket and fillet! Now find me a cow to procure such items!” – the only other addition, and this is an addition not a substitution – is something with lots of fatty gooey bits. Seriously. I know what you’re thinking, ‘but Jackie, that’s not healthy’ and to that I say: GIRRRRL PLEASE (or boy). When have you ever known me to be healthy?! 4. The ‘make your own meal’ element. Pho traditionally comes with the garnish at the side which means it can be as mild, spicy, coriander-y, beansprouty, lime-y, kaffir leaves-y or onion-y as you like. I don’t like coriander leaves that much so I took all of mine out (this is why you should serve it on the side, Saigon Saigon!) but I threw in all my beansprouts, squeezed the lime and threw the lime in too, a bit of chilli, and the lime & kaffir leaves. PERFECTION. I’m not down with too much raw onion, so I skipped that one too. It should be noted that Momma Lee threw it all in. You usually get a bit of Nam-Pla (fish sauce) too, but for some reason Saigon Saigon didn’t do this. I like the saltiness so I usually put that one in as well. 5. It’s just tasty. There is nothing else to say. The only place where the pho is halfway decent in London. You should go there and see what all the fuss is about. Their starters are also lovely, lots of Vietnamese spring rolls (which are not fried) and fresh, bright ingredients. I recommend the char-grilled pork balls marinated with honey & spices served with herbs, boiled vermicelli & rice paper – you roll it yourself. It’s lovely. No photos because I was being lame with the camera, as I’ve already mentioned. Service is awesome, too, and prices are fairly decent. I know, I’m not giving you much here, but you’re just going to have to trust me on this one. Can you do that for me? I promise you, it’s good. Now, if anybody finds PHENOMENAL pho in London you know how to reach me. 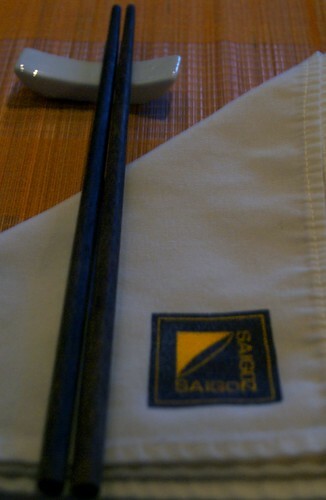 If it’s better than Saigon Saigon’s I’ll eat my… er… pho. Until next time (with more recipes, I promise), peace and love. 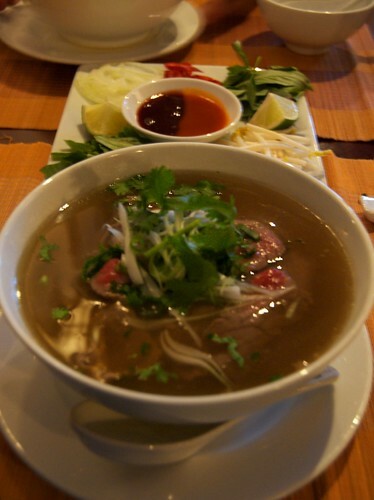 I loved learning more about pho…and I'm glad to hear from you, my sweet blogging friend. I have yet to try pho before (can you believe it?). I need to remedy that quickly. You are such a sweetheart =) Do, please! Pho is too good to be missing out on it! I love PHo! and I've been telling my hubby that I want to learn how to make good soup for Pho! So the pressure is on you to develop the soup! lol! just kidding!